03 Be my Psychotic Slave! Every release by Kadaver is always as dirty, twisted and, most noticeable – unbearable as inhumanely possible. I have his album – Abandon all hope, which was released by The Noir Series a while ago. It’s a nicely packaged album, which is a part of a very short series (only three titles to it), which also had an album by the vault in its arsenal. Mask of the Slave records now present these two albums together in a remastered edition, which basically means that you get to die the same horrid death, but with a sharper knife and a more powerful thrust this time. With their sound manipulations, Kadaver and the vault are running their fingers on the listener’s spine, looking for only one result. We all know, from the mere definition of the noise genre and death industrial/ambient, that there is no place for petty things such as any form of sentiment or restraint. What we do have in here, courtesy of the two artists, is the dry, crusted lairs of distorted – no, DESTROYED sounds, which builds a mockery of the idea of music. 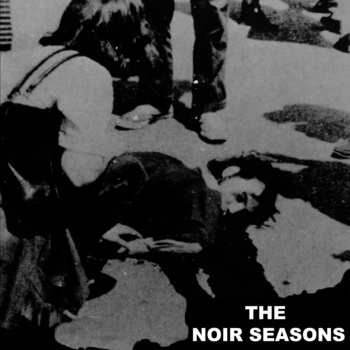 Noir Seasons serves as a conduit, passing the pain in the hearts of Kadaver and The Vault, to the stomach of those who listen to them. Even if you’re their most dedicated and loving fan, the music of Noir Seasons is forcing itself violently on the ears and on the mind. Leaving no room to breathe, the almost, almost impossible weight of the album leaves its mark on me like a rusty hammer. When it fades away to true death, upon the end of the album, the silence that takes place is empty and unforgiving, as if the Noir Seasons leaks out of the recording, turning reality around it to dead gray, turning their traumatized surrounding into a pandemonium where there is a distinct pleasure in abandoning all hope.